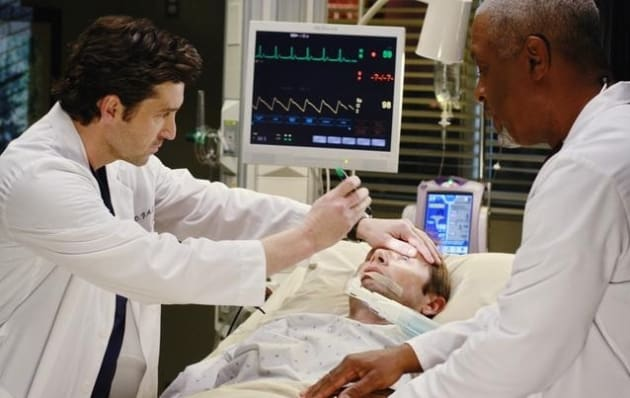 Derek and Richard do everything they can to save the life of this patient. That's what makes them the best. Grey's Anatomy Pictures: "Before and After"
Lexie: Wait, what's the prize? Chief: You get to scrub in on Shepherd's craniotomy. Chief: And hold the doomsday sucker. Lexie: What's the doomsday sucker? Chief: It's just a really big sucker. Every patient's story starts the same way. It starts with them being fine, it starts in the before. They cling to this moment, this memory of being fine, this before, as though talking about it may somehow bring it back. But what they don't realize is that they're talking about it to us, their doctors and that means there's no going back. By the time they see us, they're already in the after. And while every patient's story starts the same way, how the story ends depends on us, on how well we diagnose and treat. We know the story hinges on us and we all want to be the hero.